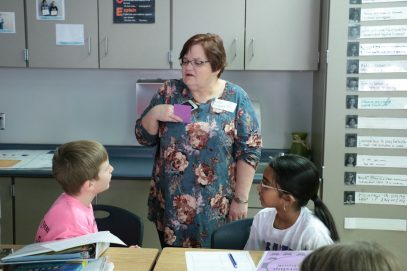 Waukee Community School District (WCSD) Leader In Me schools Brookview Elementary, Maple Grove Elementary and Waukee Elementary each celebrated Leadership Day the week of February 26. An entire day was dedicated to displaying the leadership and responsibility their students practice every day. Educators from WCSD and other districts in Iowa came to the event to learn about the Leader In Me philosophy and how it’s incorporated into the elementary curriculum at these schools. There are 3,529 schools internationally that participate in Leader In Me. Leader In Me schools utilizes Franklin Covey’s process of coaching, recognizing and reflecting on habits such as leadership, teamwork, problem-solving, etc. The main idea emphasized throughout the philosophy is that everyone can be a leader and can initiate change. All staff members in these buildings participate in the Leader In Me process. Brookview’s Elementary second grade teacher Cari Bergman shared her story during the event. At first, she did not truly believe in the process but tried it for the sake of her students. Soon, her mental health and self-esteem began to improve. Additionally, Maple Grove Elementary teacher Carly Stahn used the interpersonal habits in her personal life and managed to reach her weight loss goals and cut her body weight in half. Stahn went on to receive $10,000 from Farrell’s Extreme Body Transformation for her achievement. “You need to get specific, measurable goals, make purposeful and meaningful action steps, keep yourself accountable, and never give up. If you do what you say you are going to do, success is yours,” said Stahn. Currently, six WCSD schools have implemented Leader In Me: Brookview Elementary, Maple Grove Elementary, Shuler Elementary, Walnut Hills Elementary, Waukee Elementary and Woodland Hills Elementary. “The integration of the Leader In Me has had an incredibly positive impact on our school’s climate and culture as well as our student achievement and attendance. 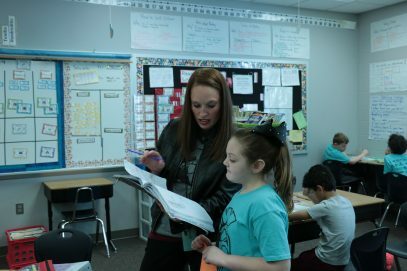 There are countless examples as to how paradigms have shifted as a result of implementing the principles of each of the eight habits,” said Maple Grove principal Kimberly Tierney. Eason and Grant Ragan Elementary School are finding success with other teaching philosophies. Eason Elementary School has been featured in the book The Curious Classroom by Harvey Daniels for its success in teaching with student-directed inquiry. Grant Ragan Elementary School is in the process of implementing Responsive Classroom, an evidence-based approach to education that focuses on the strong relationship between academic success and social-emotional learning (SEL). Students at Maple Grove explain Leader In Me to a visitor. Maple Grove kindergartners share their reading journals with a couple of visitors. A table group of Maple Grove kindergarten students write in and share their Leadership binders with district staff. A first grade student from Waukee Elementary shares her leadership journal with a Leader In Me visitors. Fifth grade Waukee Elementary students shares his leadership journal with a school district staff member. A Waukee Elementary student and a school district staff visitor discuss his leadership journal. Waukee Elementary third grade students display their reading growth on a bulletin board. Maple Grove Kindergartners display their reading minutes on a bulletin board. 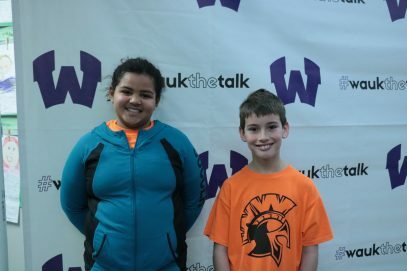 Two Maple Grove Elementary student helpers are ready to “Wauk the Talk” on Leader In Me day. Three fourth grade Maple Grove students stand anxiously waiting for Leader In Me Day to begin. Two kindergartners stand by the classroom entry to welcome any visitors in. Two Waukee Elementary students share their leadership journal entries with a school staff member. Two Waukee Elementary students sit with a school staff member as they explain their leadership entries. Three Maple Grove second grade students explain their service project to a school staff member. The project encouraged all grades to bring in pop tabs and after they traded in the tab collection for profit, they donated that money to the Ronald McDonald house. Waukee Elementary’s Lighthouse team poses for a picture with their Leader In Me Day props. These students will guide the different groups of visitors around the school. A group of school district staff members laugh and smile during the welcoming speech at the Maple Grove Leader In Me Day. Two Waukee Elementary lighthouse leaders call up the group of visitors they will be guiding for the day. A Waukee Elementary fifth grade class plays a teamwork game with the Leader In Me visitors where they all work together to keep the strings off the ground. A Maple Grove student speaker shares information about the Leader In Me program to kick off the welcome ceremony of the day. A group of visitors listen intently as two second grade Maple Grove students explain their grade’s reading growth. A Leader In Me visitor flips through a leadership journal with a third grade student. A Waukee Elementary student greets a visitor with a handshake as she enters the classroom. Third grade Hannah O’Conner speaks during the Brookview Leader In Me Day. A Leader In Me attendee collaborates with a third grade student as they work through a leadership exercise. 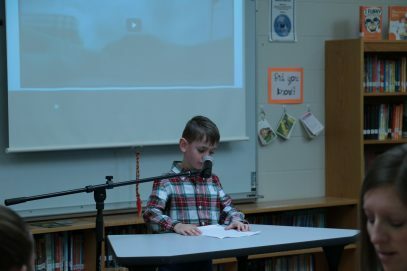 Kindergartner Brendan O’Conner speaks during the Brookview Leader in Me Day. Two Waukee Elementary students answer questions that their classroom’s visitor has during the Leader In Me day at Waukee Elementary. A second grade and fifth grade student at Maple Grove enter the media center to begin giving tours to groups of visitors. Brookview alum Cameron Boyle gives a speech about the Hurricane Harvey fundraiser he initiated. The fundraiser included several school districts and raised $3,000 for the cause. A visitor discusses leadership skills with a Maple Grove fourth grade student on Leader In Me day. Fourth grade Maple Grove students display and share their reading growth with the Leader In Me attendees.